Most of our students are enrolled in the Recreational Program ( Twinkle toes, Ballet, Pointe, Jazz/Lyrical/ Hip Hop, Acro, Tap) which is open to students of all ages, and all levels. Although some classes are divided in groups by ability, while others are general and include different ability levels, we do our best to keep a healthy combination of age, skill level and years of experience. Therefore, in many cases you can choose from beginner, intermediate or advanced classes. Adult Ballroom and Broadway Star Theatre program are also within the Recreational Class Program. Students in the Recreational Program take anywhere between 1 and 5 hours of instruction each week, depending on personal preference. 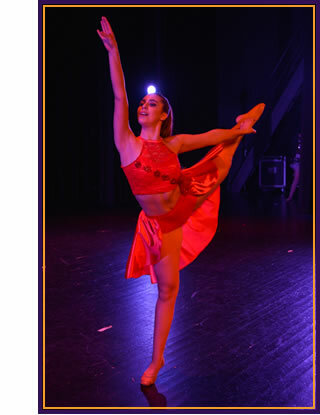 All Recreational students participate in the two Dance Shows the Studio produces each year , as well as other showcase performances the studio implements each year. Competition students take part in Regional Dance Competitions, which normally run between February and the end of May, as well as in the two Dance shows which the studio produces each. Showcase performances such as TV appearances, fundraising shows, and other opportunities are other great opportunities for our dancers to display their experiences and skills. Our competitive program was added in 2011 and has already won incredible awards at well known Regional Competitions. Our teams repeatedly place amongst the Top 5 winners, many times taking the 1st places awards home. We also have achieved Title winners , Best Studio Director, Best entertainment, Best technique, Best Choreography, Best Sportsmanship, Title winners and Overall Top Score,of the entire competition amongst other honors. Some competitions we have attended: Nextstar, World Class Talent, On Point, Elite Dance Challenge, Beyond the Stars, Power of Dance, Take Center Stage dance challenge, Turn it up!, Dancer's Inc, Royal Dance Competition and more. Our choreographers have been recognized with many Choreography Awards by highly respected judges and national competition organizations. We are very proud of our amazing dancers' accomplishments as competitors representing our studio. We work as a Dance family. Your family members are always welcome and there will always be a smile waiting for you at the studio. We encourage and treasure relationship building, sportsmanship, and friendship. We welcome diversity. New to the country? New to the area? We understand the challenge of adapting to a new environmnent. Our Director was born and raised in Argentina, and knows all too well what is like to become part of somewhere new. We pride ourselves in having the largest amount of students coming from exciting locations such as Brazil, Spain, France, Italy, Czech Republic, England, Ireland.. the more nations the better! Welcome! We can also conduct classes in Spanish! Some dance studios pride themselves in having you be their 100th, 200th student. To us, YOUR CHILD IS NOT A NUMBER. NOT JUST ONE MORE STUDENT. Your child is an individual, with his/her own talents, needs, desires and dreams. 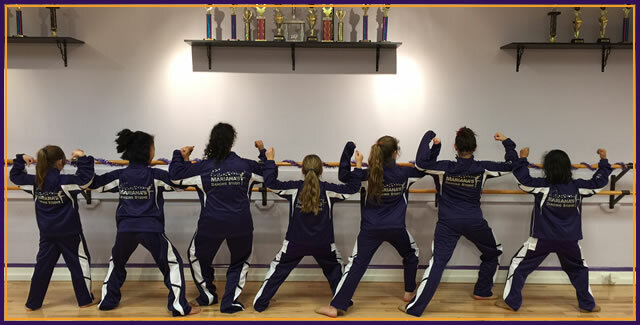 We are committed to offering not only a great experience for your child, but a solid Dance Education rooted in proper technique, vocabulary and creativity. When your child leaves class smiling and wants to practice dancing all around the house, then we know we accomplished our goal: to inspire them and have them feel the joy that comes from dancing. We place great emphasis on the development of self confidence and positive body image, which comes from challenging each student through dance and then transmitting that experience to an audience. We appreciate each dancer for who she is`and what she has to offer, not only artistically but also as a unique human being with needs, desires and hopes. We strongly believe in each student's ability to reach their potential, and recognize each young person's need to express themselves through music and their bodies, offering them a safe environment in which to do this while learning dance techniques and combinations all blended into fun choreography. We take Bullying very seriously. Excluding, name calling, insulting, pushing, cyber bullying, criticizing, gossiping, fighting are not at all allowed and can cost a student their participation in class if our rules are not respected. Our message is clear: kindness, openness of heart, honesty, mutual support, encouragement. We firmly believe that any child who wants to dance and shows an interest in dancing should be able to do so by taking formal dance training to explore this exciting art form and the joy that results from it. We happily invite you and your family to our fun, exciting, bond-inducing, artistic, creative and unique Dance Program. We are waiting for you! Come dance with us!